And Tomorrow? Mobilize the Working Class Now to Resist! The immigrant population of the United States is under attack, the target of a racist assault unleashed by the highest levels of government. On May 11, the Senate and House of Representatives in Washington approved a draconian immigration law, known as the “Real ID Act,” which purports to establish uniform norms for driver’s licenses issued by the 50 states. Although it is presented as an “anti-terrorist” measure, in fact its target is the 11 (or more) million undocumented immigrants who live and work in this country. The racists figure that with a stroke of the pen by George Bush, who signed the law that same night, they will prevent “illegal aliens” from driving. If it were carried out, this would not only be a personal trauma for millions of families, who need to drive a car in order to survive, but also a mortal blow against important sectors of the capitalist economy, which depend on workers without legal rights for their low-wage labor. More than likely, it will make the lives of this vital sector of the working class an even worse nightmare, while raising the price on the black market for “substitute” documents. Still more sinister, for the entire U.S. population, with this step we are getting closer to the dreaded national identification card, a police-state measure that both right-wing Republicans and not a few liberal Democrats have been advocating for decades. The peremptory command, “Show your papers,” will not only be something heard in old movies about the Nazi dictatorship, where the German police shout “Ausweis zeigen!” or under the South African apartheid regime with its pass laws, but it will be a daily experience at highway roadblocks, subway inspections and the entrances to buildings, schools and hospitals. This racist abuse against immigrants is the opening wedge of an attack on the democratic rights of all. In the face of the threat represented by the Real ID Act, together with previous anti-immigrant laws such as the U.S.A. Patriot Act and the immigration “reform” of 1996, many immigrant rights organizations have placed their hopes in the capitalist courts and liberal bourgeois politicians. The same day the Senate approved the federal driver’s license law, a New York Supreme Court judge, Karen Smith, ruled that the NY Department of Motor Vehicles (DMV) cannot cancel the driver’s licenses of undocumented immigrants for lack of a valid Social Security card. The DMV was not authorized by the state legislature to regulate immigration matters, she declared, granting the injunction sought by the Puerto Rican Legal Defense and Educational Fund (PRLDEF). Human rights defense groups cried victory. “Green Light for Driver’s Licenses for the Undocumented,” headlined the New York daily Hoy (11 May). Yet the injunction will not be implemented, since the state attorney general (Democrat Elliot Spitzer) appealed the decision to a higher court, and now it may be overruled by the new federal law. You couldn’t put it more clearly. According to this bill (S. 1033/H.R. 2330), the fines and penalties for undocumented immigrants will exceed $2,000 per adult, the visa will only last for six years, applicants will be subjected to a security background check, they will have to pay back income taxes, will have to register with draft boards for military service, and will be deported if they are out of work for more than 60 days. All in all, it is clear that only a small portion of undocumented workers would make use of this hypothetical H-5B visa. As for the H-5A visa foreseen under the Kennedy-McCain bill, this is nothing but a recycling of President George Bush’s proposal to once again create the category of “guest workers,” who after their allotted time in the U.S. is up will be sent “home.” Announced in his annual State of the Union address in January 2004 and then trumpeted in a meeting of the two ranchers, Bush and Mexican president Vicente Fox, the proposal became a dead letter in the face of the pressure of the Republican right wing. The new “bipartisan” bill was written so as to invite the support of the U.S. president – the sponsors explicitly say as much – but it will probably end up sharing the fate of Bush’s earlier initiative. And although it has been hailed by bourgeois Hispanic groups such as LULAC (League of United Latin American Citizens) and MALDEF (Mexican-American Legal Defense and Education Fund), it does nothing for undocumented workers but instead seeks to “punish” them. The bitter truth is that the whole “debate” over immigration is subordinate to the fundamental issue of the imperialist “war without end” which U.S. rulers proclaimed following the 11 September 2001 attack on the World Trade Center and the Pentagon. Both Democrats and Republicans used 9/11 to justify their slaughter, which like all imperialist wars over the last century has intensified anti-immigrant hysteria. Immediately after the war on Afghanistan was launched, thousands of Arabs and South Asians were rounded up and arrested. They were held incommunicado, and the government even refused to release their names. Around the country discrimination against immigrants escalated. To celebrate his second-term election victory, President Bush ordered a human slaughter in the Iraqi city of Falluja that was worthy of the Nazi regime (or the Israeli army against Palestinians, or U.S. imperialism in Japan, Vietnam, etc.). Closely linked to the war and the increased electoral clout of the far right is the rise of paramilitary vigilante groups along the border with the aim of hunting immigrants. Groups like the Minuteman Project and the Arizona Guard strut around with AR-15 rifles and Glock pistols in their “roadblocks” which consist of folding chairs and coolers stocked with beer. They were buoyed by the success in last November’s election of the “Arizona Citizen and Taxpayer Protection Act” initiative, which would deny immigrants the use of public services. The racist paramilitaries are only the most blatant expression of the across-the-board onslaught against immigrant workers. These cowardly thugs should be run off by the power of the organized working class. The calls by liberal groups on Bush and Congress for an “amnesty” are doomed to defeat. And why the hell is it necessary to amnesty those who have committed no crime? In order to tear down the walls that are being built, to shatter their xenophobic laws and defeat racist reaction, it is necessary to mobilize the tremendous power of the multiracial and multinational working class. To begin with, very concrete actions such as a New York City taxi strike against the “Real ID” law would make quite clear to the ruling class how much it depends on immigrant workers ... and the chaos that this racist act will unleash. Following September 11, there was a sudden upsurge in racist attacks on immigrants. Sikh taxi drivers set upon in the center of Brooklyn because they wear turbans, fires set at mosques. The City University of New York (CUNY) launch­ed a “war purge” against “undocumented” students, against which the Internationalist Group initiated a campaign of protest involving trade unionists and associations of immigrant workers (among them taxi drivers). Already in preceding months there had been a rash of potentially deadly attacks against Latin American immigrants in Farmingville and then Farmingdale on Long Island. In this climate poisoned by chauvinism, in December 2003, the administration of NY governor George Pataki and his director of the DMV decided to make their “contribution” to the “war on terror,” by demanding from all drivers a valid Social Security number, or their licenses would be revoked. With the backing of the Department of “Homeland Security,” the New York Department of Motor Vehicles mail­ed thousands of letters in a selective way, which had the effect of terrorizing immigrant families throughout the state. They demanded that the recipients come to the DMV offices within two weeks to verify the Social Security number with which they obtained their licenses. According to the authorities, of the 600,000 letters sent out, more than 250,000 were not answered. So far they have suspended some 7,000 drivers’ licenses, but they intend to do the same with the remaining quarter of a million. This will have disastrous consequences. Many immigrant workers will lose their job. 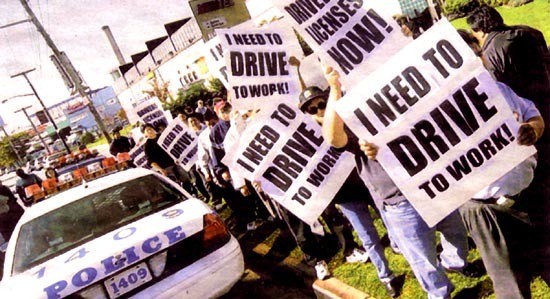 “I Need to Drive to Work!” read signs in various protests against this discriminatory action. People also need to drive a car to take children to school and go to hospitals. In California in October 2003, now ex-governor Grey Davis, seeking to get votes on the eve of a special recall election, signed a law allowing undocumented immigrants to get driver’s licenses. However, the current governor, Arnold Schwarzenegger, then annulled this law, after winning the election with the votes of racist supporters of “English only,” who in the past have approved a whole series of propositions denying immigrants access to fundamental services. Thus the governor deprived hundreds of thousands of immigrants of a basic identification document, with the predictable result of an increase in the number of drivers on the highways who have no license and no insurance. Now, in a characteristic note for this racist actor, friend of the Austrian fascist Jörg Haider and admirer of the political talents of Hitler, Schwarzenegger has come out in favor of the anti-immigrant vigilantes on the southern border. As for the new “Real ID” law, it requires that driver’s licenses be based on a number of documents (birth certificate, Social Security card, proof of citizenship or legal residency, etc. ), with additional biometric information, in a machine-readable format. Although it doesn’t specify what technology is to be used, it will probably be the same RFID (radio frequency identification) chip, the so-called “spy chip,” that the U.S. government wants to force all countries to use in their passports. The law insists that if any state refuses to follow these rules, then in the rest of the country their licenses will not be recognized as an identification document. The residents of those states would have to use other documents, such as a passport, to get on a plane or eventually to travel by train. In fact, in places like New York, the mutual hostility with the rest of the country is such (in antiwar demonstrations there have been signs with the slogan, “U.S. Out of N.Y.!”) that demanding a passport for those entering or leaving New York could get to be very popular, on both sides of the Hudson River! And once it exists, it won’t just be used for driver’s licenses. It will also doubtless be required to open a bank account, buy a house, or get treatment at a hospital. And it’s not only in the U.S. that this is happening – in Britain the Blair government, after being reelected by the votes of barely 20 percent of the electorate, is ratcheting up the pressure to ram through “fast-track” approval of a national ID card in a matter of weeks. The scope of the new U.S. law is not limited to an ID card. The first section introduces a series of measures to make it more difficult to obtain political asylum or to stop deportation. From now on, anyone requesting asylum must submit “evidence” that would “corroborate” their allegations of maltreatment. As if torturers the world over, like the psychopaths at Abu Ghraib who were carrying out the orders of secretary of war Rumsfeld, would take photos of their deeds, and then give their victims an affidavit of torture that could be handed to the ICE (Immigration and Customs Enforcement – the latest incarnation of the migra, the hated U.S. immigrations cops). The same section permits deportation even while an asylum petition is being heard, preventing courts from stopping it if the government claims that the individual belongs to or supports any organization on an administrative black list. Another part of the law exempts the construction of a law or barrier all along the border from any legal prohibition or restraint. The new “security” budget assigns some $455 million to hiring more criminal investigators, ICE agents and deportation officials, and another $177 million for more Border Patrol agents. It also authorized unlimited sums to investigate and implement ground surveillance technologies (videos, sensors and motion detectors). The law is a veritable grab-bag of anti-immigrant repression, and has unleashed a wave of opposition in Mexico in particular. The Fox government sent a note of protest, in part to recover from the angry protests over the Mexican president’s racist remark that Latino immigrants do the jobs that “not even blacks want to do.” Even Cardinal Norberto Rivera called the U.S. pretense of sealing the border “ridiculous,” criticizing the “walls of shame” (La Jornada, 16 May). It is instructive that the new legal attack on immigrants, the most vulnerable section of the U.S. working class, was approved as part of the legislation financing the continuation of the imperialist war in the Near East. In point of fact, imperialist wars always involve an intensification of police repression and racist victimization “at home.” This represents a consensus within the ruling class (both Democrats and Republicans voted for the war and for the draconian repressive laws such as the U.S.A. PATRIOT and Real ID acts) on the need to regiment the population and fence off the borders. This bipartisan war front is also reflected in the increasing activity of fascistic groups. While the Minutemen prowl along the Arizona border, other immigrant-bashing groups are springing up, such as NumbersUSA or the Coalition for Secure Driver’s licenses. And in line with new technologies, campaigns such as “reportillegals.com” and “noinvaders.org” incite the population to spy on and turn in their neighbors via the Internet. This also creates the climate for outbreaks of xenophobic hatred against immigrants, like the racist “Tsunami Song” broadcast over the Hot 97 radio station in New York, last January, which reveled in the deaths of Chinese, Asians, Africans, children and mothers in the Indonesian tidal wave. But by far the most dangerous of the scum who profit from tragedy and groove on oppression, are the racist capitalist state with its attacks against the exploited and oppressed. Following 9/11, the arrest of thousands of Arab and South Asian immigrants and the surge of chauvinist discrimination represented a blow against the whole of the U.S. working class. In recent months, the bourgeoisie, bogged down in Iraq, has undertaken a racist campaign of repression aimed at terrorizing millions of immigrant working people here. The “Homeland Security” Administration seeks to “encourage states and localities to help enforce immigration laws,” first in Alabama and then in Colorado, Idaho and Virginia, according to the New York Times (12 April 2004). Simultaneously, the federal government has carried out huge raids, such as the one at Newark, New Jersey’s “Liberty Airport” where they arrested 134 passengers on one day in April 2004, or the Border Patrol raid in San Bernardino and Riverside counties of southern California, where they hauled in more than 150 immigrants (Los Angeles Times, 10 June 2004). There have been numerous protests against the rise of anti-immigrant repression, but almost all are oriented toward seeking the support of bourgeois politicians. At a picket of over 100 people outside the Manhattan offices of the NY DMV on 13 April 2004, a series of clergymen and bourgeois politicians begged the governor to revise his decree. They stressed that an increase of unlicensed drivers would lead to more uninsured vehicles, raising insurance rates for everyone. The month before, they took 500 immigrants to lobby the state legislature in Albany. In subsequent recommendations to the DMV, they outrageously suggested to “make licenses and other identification documents more fraud-proof” by using holograms and tamper-resistant paper. They want to divert immigrants’ discontent into the sterile channels of bourgeois parliamentarism, and in so doing they legitimize talk of “secure” immigration. The NYIC says, “We are eager to work with our lawmakers and President Bush to improve the bill.” But they don’t mention the passage of the “Real ID” law, nor the fact that the Kennedy-McCain bill they praise would impose thousands of dollars of fines and penalties on undocumented immigrants seeking to regularize their immigration status. The impotence of the purely symbolic protests organized by the liberal Democrats and union bureaucrats is obvious. Neither the New York governor nor the legislature did anything against the driver’s license suspensions, the “Real ID” was rushed through at full steam, and the judge’s ruling nullifying the DMV’s action was stayed. The Kennedy-McCain bill is a new attack against immigrants who lack papers, as well as having little chance of passage in the present political climate. Instead of the dead-end of bourgoeis politics, it is urgently necessary to undertake a genuine class struggle of the workers and the oppressed for fundamental democratic rights for immigrants. The multiracial, multiethnic and increasingly multinational working class of the United States must mobilize to demand full citizenship rights for all immigrants, now! This is closely linked to the struggle to defeat the imperialist war, through proletarian class struggle on an international scale, such as workers strikes against the war. Against factory raids, a protest by some hundreds of workers in the traditional garment center of Manhattan would have an enormous impact. And in the face of an upsurge in deportations or a new wave of massive detentions, the working class should mobilize to block them, in the streets and in the airports. One of the most important steps to block the blows of the repressors would be a massive and militant unionization campaign. However, the biggest obstacle to a successful campaign to unionize millions of immigrant workers is the trade-union bureaucracy itself, politically subordinated to the Democratic Party and highly integrated into the machinery of the capitalist state. Out of loyalty to the bourgeois order, it refuses to use class-struggle methods, saying they are “illegal.” The key is to oust the bureaucrats, break with the Democrats, and forge a multiracial, multinational revolutionary workers party.